Hays came to the Gary Cornelsen Sports Complex and beat Liberal 2-1 in girls soccer Thursday afternoon. 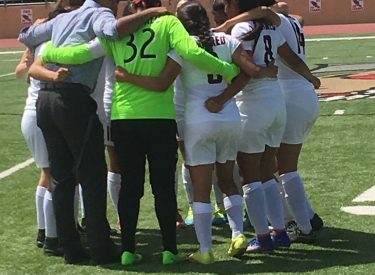 LHS head soccer coach Carlos Ruiz says the girls weren’t on. “We didn’t play our best and still had opportunities, we were flat for most of the game,” Ruiz said. Hays scored early in the game at the 37:18 mark. LHS tied the game when Gisselle Melendez scored into the north net at the 20:26 mark to tie the game. Hays took the lead at the 12:27 mark. Hays led in corner kicks 6-1 and led shots on goal 10-5. Reyna Gonzalez had eight saves for the Redskins. The Indians are 6-3 and 2-2 in the WAC while Liberal is 4-5 and 2-3 in the WAC. LHS plays at Great Bend Tuesday.